A welcome and hard fought three points that was spoiled by erratic officiating. losing control with ten bookings and a harsh sending off of Tyrone Barnett on 55 mins. support Riley as Newport tried to exploit the left flank through Sandell. An enjoyable and dramatic afternoon at Grenoble Road. Thought Darryl Eales' programme notes were a must read - here they are! The ref was the worst I can remember in years. Whether he was inexperienced at this level, or simply crap, he just could not deal with the off-the-ball fouling and general diving and cheating we have now come to expect from Edinburgh's team. Inevitably he lost the plot and lost control of the game. Maybe I am missing something, but from my angle, when Barnett slid in for his first booking, he was absolutely clearly sliding across in front of the Newport player, not at him. The way he (Yakubu?) then went down, it is not surprising that, from a side-on angle, the ref thought Barnett had gone at the player...let alone the way half the Newport team then went at the ref. As for the second card, I thought Barnett was just being silly, bumping into the defender after the ball had gone. I was wrong - it is clear from the FLS clip that it was simply going for the ball. Maybe a foul, sure, but never a card. But to happier things. I though our first half play was good - although Barnett should have done better when he shot across the goal. But with the free kick, as a friend said, get the ball on target and see what happens...For a team that has looked so vulnerable defensively this season, our second half performance was incredible. Great to have Clarke back, Mullins seemed to grow in the Captain's role, but I thought Raynes was absolutely immense. It was also interesting to see how he was organising, talking, encouraging, throughout that second half. Wright may be club captain, but on that performance (and Wright not being as good of late as he has been in previous seasons) I would stick with Mullins and Raynes until or unless there is a significant reason for change. Not convinced by taking Rose off, and I was surprised Whing instead of one of Brown and Morris, but ultimately that mattered not a jot. Nervy for the last half-hour, but what a fantastic team performance. 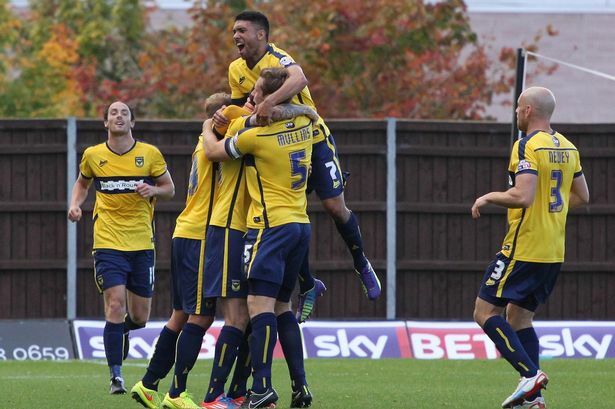 MICHAEL COLLINS admits Oxford agreed to do the "ugly things" better if they were to clamber out of the drop zone. The defender said: "It's finetuning and one of the things addressed by everybody to improve results was to do the ugly things a bit better." Collins' long-range free-kick won it despite Tyrone Barnett's early red card. Newport boss Justin Edinburgh said: "To lose to the flukey goal like we did, we're disappointed." This is the key, the missing Plan B. Pretty football is all well and good, but three points at home is what I want, and if it needs some ugly football as well, then fine by me. Clarke back in goal was a huge positive. He seems to have speeded up his distribution, although playing backs-to-the-wall for the last half hour, I felt he was entitled to catch the ball and roll around while the players regrouped. The ref spoiled the game with the sending off and ten yellow cards. Where he got six minutes added time from is a mystery as there were hardly any injuries I remember. The referee is obliged to add half a minute for each substition and there were six of them in the 2nd half. Also Barnett's sending off would have added time, probably a minute. It soon adds up. It was like Fergie time. I thought he would keep adding more time in injury time until Newport got an equaliser. Good to see Newey playing well, I liked O'Dowda's? little flick back when nearly letting the ball go off. Mullins is a good captain. Towards the end, Morris and O'Dowda were close to getting a good counter-attacking goal but a misunderstanding meant it didn't work out. Hopefully they will learn. I also liked one of our defenders having a long run all the way from the back , but just ran out of puff. We lost a little of the pretty football, and gained a little forceful football. No bad thing IMHO in this division and the balance between the two was just about right. Newport are a decent side and to beat them with 10 men was pleasing. The ref had a shocker, not helped by the usual impotent linos. Surely if they are to be referees assistants, then they must be capable of making decisions to the same standard. It was far from a dirty game, but the number of cards issued probably went into double figures. That is simply not on. We pay to watch footballers entertain us. Not to watch referees rob us of entertainment. There were maybe 3 or 4 legitimate yellow cards in that game. Great to have Clarkey back. He made a massive difference. The back line clearly had more confidence in him than Long, as they played further up the pitch. Clarkey didn't shy from dominating his area (and I mean penalty area, not the 6 yard box that Long sticks to). I think he made only one mistake all game, coming to early and too far out of his box when Mullins had been beaten for pace. I have no doubt that Clarkey made a very significant difference to us getting the clean sheet. We are fortunate to have 3 very good centre backs that we can rotate as necessary. Raynes looked assured and not like he hadn't played for a while at all, and his fitness was excellent. I would have liked to see Riley get forward a little more. He played more the full back role, than the wing back role. Good decision to play Rosey, who I thought was a candidate for MoM. Rosey and Collins are a really good central midfield pairing and Ruffels has been off his peak standard for some weeks. The only area we lacked was up front. Hylton played well, and I don't begrudge him the miss as he was steretching to even get to the ball. However, Mr Barnett had several golden opportunities that he spurned. That is much too costly. At least he is getting in the right positions, however, it results in Hylton being played wider, which I am less keen on. I would prefer to see Hylton and Jakubiak up front, with Hylton in the middle. But we have too many sub-standard strikers at the club. Morris isn't good enough, Barnett isn't good enough (albeit that he is improving slowly with match practice), Potter is nowhere to be seen, Brown is sub-standard. We need to get the sub-standard players off the wage bill, and replace them asap. We might then have a chance of clawing our way up the table. Much more positive today than at any time in the last month though. GodalmingYellow wrote: I would prefer to see Hylton and Jakubiak up front, with Hylton in the middle. But we have too many sub-standard strikers at the club. Morris isn't good enough, Barnett isn't good enough (albeit that he is improving slowly with match practice), Potter is nowhere to be seen, Brown is sub-standard. In the games I have seen Junior Brown has looked very useful. Alex Jakubiak, by contrast, has never looked like the answer to anything - unless 'can you dribble into this blind alley and lose the ball?' is the question. But I haven't seen any home games since Burton, and it's a game of opinions! Don't forget we've got Will Hoskins to come back as well. The club website had an article last week saying his recovery was ahead of schedule, but noticeably failed to put any kind of timescale on it. Now you see it is the opposite way around as I've seen it. Junior Brown tends to run up blind alleys and gives the ball away too cheaply. He plays a very similar game to Potter, not releasing the ball until it is too late. Jakubiak on the other hand is much quicker and has much better close control. I certainly don't think he is the solution, but he's far better than Brown based on what I've seen. Against West Brom, Jakubiak was superb for example. True about Will "Bob" Hoskins. Whether he is the solution remains to be seen, but when he is fit he would get in ahead of the other bench warmers. 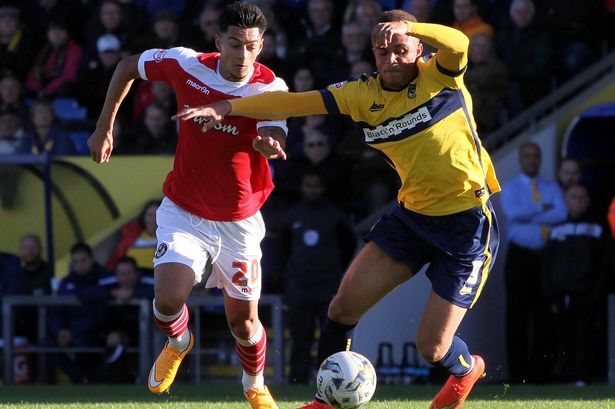 Junior Brown looked great at Ashton Gate, and reasonable against Burton and at Luton. Morris also looked good at Bristol City and I don't think I've seen him at all since then. Jakubiak looked pretty clueless at Exeter and Luton, but wasn't really given long enough to make a mark in either. Barnett I've seen have two poor games, but of the four he's the one I have most hope for. I look forward to seeing Hoskins, who has the best pedigree of the lot. If he's really only a few weeks away then that's great news - originally he was going to be out til the new year. But yes, with that lot and Hylton, Howard and O'Dowda (who are pretty much all first-choice picks in the front four at the moment) that's a lot of forwards to keep happy. And it's got to be bye bye Alfie I'm afraid. But I think at least two of those wil be going back at Xmas when their loans end? Kernow Yellow wrote: And it's got to be bye bye Alfie I'm afraid.